The last week before winter break is both wonderful and terrible. On one hand, you’re basking in holiday cheer, but on the other hand, most of your students are so wound up that they’re (sometimes literally) tearing down the walls. When your students want to be anywhere but your classroom, it’s hard to believe you can get them to focus—but you can, and you will. Here are a few classroom management tips from longtime teachers Deb Schaeffer and Brittney Cook to help keep your classes running smoothly. Kids space out if they don’t think they can participate. Start lessons with questions that anyone in the room can answer. A good example of this is asking kids a question like “what can you see?” This works with everything from a comic strip to a math equation. They can say anything from “I see x show up 3 times” to “I see a polynomial”. Make it easy for kids to get engaged for the first few moments of class, and you’ll have a much easier time getting them to focus for the next hour. Sometimes the routine you’ve set out in the beginning of the year won’t work. When this happens, don’t be afraid to try something new. This could mean anything from changing up the structure of your lesson to revamping the setup of your classroom. Are your students not in the mood to start class by sitting still? Put group work in the first half of the class and let the debrief flow into direct instruction. Do you find kids spacing out in the middle of class because there’s a lull? Re-arrange desks so that kids can sit in groups to lighten up the mood. Is a holiday like Christmas, Valentine’s Day, or Halloween coming up? Pull some of these elements into your lesson for the day before diving into your regular content. Change is sometimes the kick that you (and the kids) need to be refreshed. Even if the thing you’re testing out doesn’t work, you can rethink other ways to shake things up for the better. Kids are perceptive—they appreciate authenticity, and building a relationship with them means being open with them about who you are, and showing them the parts yourself that make you interesting, funny, or weird. Be vulnerable. It’s okay to let kids know that you are an imperfect human being and that you’re still trying to do the right thing. Don’t be afraid to apologize if you say something that you shouldn’t have— students want to know that you care about their feelings, and they’ll appreciate that you can admit that you’ve made a mistake. You can also tap into your students’ empathy to help smooth over disagreements. Even the most difficult kids don’t intentionally set out to burn bridges with you, and are willing to patch things up after a hard class. By pulling students aside and telling them if something they’ve said has bothered you or telling them that you want to build a better relationship with them, you can help them understand your perspective. Like most great teachers, Brittney and Deb deeply believe that “building a personal connection is must, not an option”. Putting effort into learning about your students’ lives and complimenting them on things like their hair, their style, or their handwriting goes a long way. Everyone wants to feel noticed—remembering details about your students can do a lot to let them know that you care about them. To get to know your students on a deeper level, also try interviewing them one on one. Ask them about who they are, how they’d like to learn, and what they think about how you interact with them. Deb has done some great video interviews with students during lunch breaks or during prep to learn more about them. Kids appreciate being able to talk without the pressure of performing in front of their classmates and like to have one-on-one time. Context matters. Be aware of your tone of voice and if what you’re saying is a sensitive topic to students of a certain race, ethnicity, gender, or background. Consider whether you might be the best person to address certain issues. Would students feel more comfortable if someone else on staff pointed the issue out to them? Some topics might make students more uncomfortable than others, and it’s important to know when you are not necessarily the best person to say something. We know that this last week is chaotic, but you got this! Remember that your students are probably just as burned out as you are, and they need this time to recharge and slide into the break just much as you do. Happy Holidays! We hope you take this much-needed time to rest and to TREAT YOURSELF. Deb Schaeffer and Brittney Cook are Master Teaching Fellows with Math for America, a professional community of STEM teachers in New York City dedicated to inspiring excellent math and science teachers. Brittney teaches Math at Urban Assembly School for Law and Justice and Deb teaches Science at East Brooklyn Community High School. They are both high school teachers. Have a crazy classroom story you want to share? Want to hear more tips from Brittney and Deb on classroom management? Do you have advice of your own? Email us at hello@getselected.com to let us know – we’d love to hear from you. New Year, New Job? A Checklist to Jumpstart Your Search. 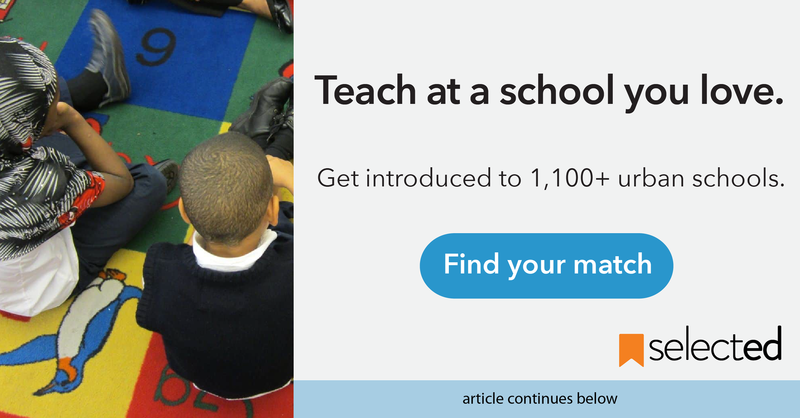 Thinking about making your next teaching move? Here are some things to think about in anticipation of your job search!